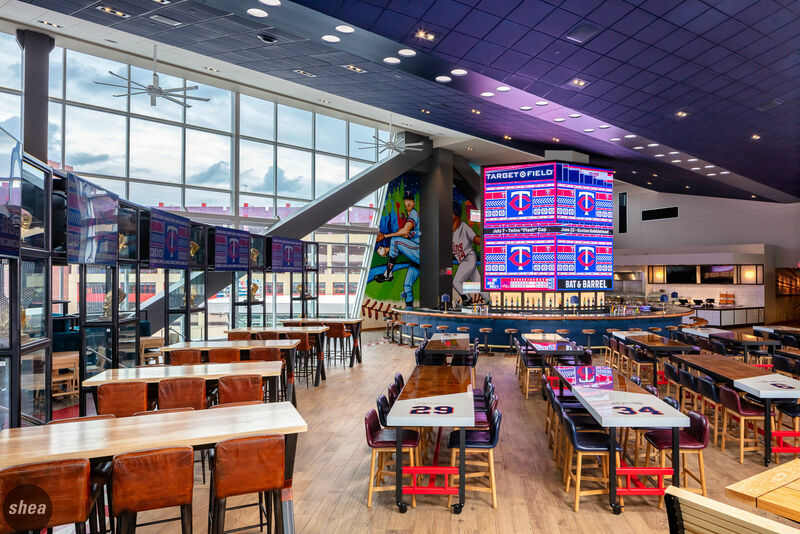 Following the success of Twins Grill at the Minneapolis-St. Paul Airport, Shea teamed up again with the Minnesota Twins to renovate the formerly exclusive Metropolitan Club to become Bat & Barrel, a new concept for Target Field. The space features two bars, plenty of dining and lounging space, and fantastic field views. In addition to architecture and design work, the Shea Production team worked with Interiors to select all specialty and other furniture, coordinated with artists and artisans to create custom artwork and furniture pieces for the space, and did a full delivery and install of all pieces, a complete package for a new era of dining at Target Field.